Can you save the kingdom from darkness? Do you have the courage, the cunning, and the will to withstand the Necromancer and his forces? Strategize, plan, and bring out the best of your abilities to end our Darkest Night! NOTE: The MSRP listed is for the boxed edition of the game. A polybagged edition is also available, for $37.99. 1) The look of the game. The board, cards, tokens and other pieces are all well illustrated and the artwork really evokes the gloomy feel of the game’s setting. 2) While billed as a co-operative game for up to four players, it is also well suited to solitaire play, and I love a good solitaire game. The rules are well organized and when new concepts are introduced they are offset from the other text in a different color. This was a good idea, but the offset color tended to blend into the background a little and thus didn’t stand out as much as intended. Important concepts are set apart by BOLD text, and symbols for Grace, Secrecy, Wounds, and Dice are used throughout the text. The main idea of the game is that an evil Necromancer has all but wiped out the forces of light and goodness in your kingdom. But all hope is not lost. A few heroes yet survive and hope to defeat the Necromancer as he consolidates his grip on power. That’s where you come in. Players take control of four heroes striving to build up enough strength and to collect holy relics to finally defeat the Necromancer. Regardless of how many players there are, there will always be four heroes (divide them up among the players). Players may choose from the nine heroes included in the base game (and up to 13 more heroes with all the expansions – see below) each with its character card and unique set of powers and abilities she brings to the fight. Each character card features an illustration of the hero, a brief description of what he’s about, two tracks at the bottom for tracking the hero’s Grace and Secrecy, and a player aid on the back. Grace and Secrecy are the stats which each hero will use as she moves about and combats the Necromancer and his minions. Grace represents that something special about heroes which, “…allows them to survive in situations where normal men would die.” In a situation where a hero is faced with death, he may expend a Grace point to save himself. While running out of Grace is not instantly fatal, it does leave the hero vulnerable; effectively, Grace = Hit Points. Secrecy represents how stealthily a hero moves about the kingdom. It both shields the hero from detection by the Necromancer (bad) and reduces the effects of various event cards. Again, running out of Secrecy not instantly fatal, but it does allow the Necromancer to attack you directly (very bad). Both stats may be replenished during the game. The heroes’ powers and abilities are represented by a deck of Power Cards for each hero. These decks consists of 10 cards; four of which have a special symbol in the upper right hand corner. Once heroes have been chosen, take out the deck associated with each and find the four cards with the special symbol. Each hero starts the game with three of these cards already in play and places those three cards face up next to his character card. Shuffle the remaining seven cards into individual decks and place them close to the related character card. There are also decks of cards for Events, the Map (used when searching, see below), and Artifacts (not to be confused with the Holy Relics). Each of these decks is shuffled and placed near the board. The four Relic counters are placed at the Forest, Mountains, Ruins, and Swamp locations. Counters for both Blights (minions of the Necromancer) and Items (useful things to have) are placed in piles near the board. Place the marker for each hero on the game board at the Monastery and the marker for the Necromancer at the Ruins. Draw a Map card for each location and place the indicate Blight on that location (not the Monastery). The game is now played in a series of rounds until one side defeats the other. Each Hero takes a turn. The order in which heroes act can change from round to round. Sometimes it’s important for one hero to act before another. The player(s) should vary the order of hero turns as best suits the situation each round, and may decide which hero goes next after each preceding hero has completed her turn. Start: follow/resolve any start of turn instructions. These are listed on Power card on the player aid cards and some are based on hero Powers. Retrieve Holy Relic (useful in defeating the Necromancer). You’ll need to discard three key tokens (found by searching) to claim an undiscovered Relic. Power (use the “action” effect of one of your Power cards). Powers have various effects and are broken down into Actions (which can be taken during the hero’s action phase instead of one of the listed actions), Tactics (which are used during combat, see Attack, above), Bonuses (used as needed), or Active Effects (which must be activated to be used). Some powers are exhausted when used, and can’t be reused until they are refreshed. Advance the Darkness Track by one. This represents things getting worse around the kingdom and activates new powers for the Necromancer. If the DT is high enough, the necromancer can place multiple Blights (see below), or even place them inside the Monastery (very bad; the Monastery is normally immune from Blight placement). The Necromancer moves. Here is where the heroes’ Secrecy level comes into play. The Necromancer rolls 1d6 and compares it to the Secrecy level of all the heroes outside of the Monastery (kind of like Sauron’s all-seeing eye in the LotR). If his roll exceeds the secrecy level of a hero, he moves one location closer to them (or stays in place if he detects a hero where he is). In the event that he detects two or more heroes he moves towards the closest hero (roll if they are equidistant). If he fails to detect ANY heroes, he moves in the direction indicated on the board. Place a Blight in his current (post movement) location. I liked this mechanic and found it be reminiscent of the way in which Dracula leaves traces of his passing in cities (see Fury of Dracula). The heroes win if they either slay the Necromancer. This is the most direct way to win, but is hard to do as only a hero with a Holy relic may fight him and any Blights in the Necromancer’s location must be defeated first. The heroes can also cleanse the land by enacting a Holy Ritual. This is more indirect, but also tricky to pull off; to enact the ritual they must collect three Holy Relics at the Monastery. The ritual takes place immediately when three Relics are in the Monastery. The Necromancer can only win in one way; by overrunning the Monastery with Blights. Normally the Monastery is safe from Blights, but if the Darkness Track is full, then Blights can be placed there. If, at any time, there are five Blights within the Monastery then the Necromancer wins and all heroes lose. It sounds simple, but it’s not. Blights will build up in locations, and each hero can only do ONE thing in each turn. Some Blights (Desecration) increase the Darkness Track and need to be wiped out ASAP, some prevent heroes in the effected location from recovering Grace, others increase the search difficulty in the effected location, and others are just creatures (Zombies, Skeletons, Liches, etc…) which need to be killed. 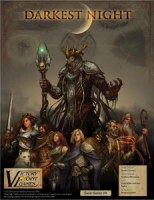 The rules also have variants which allow for a fifth hero and for the Necromancer to be controlled by a player. Using these rules, you could play with up to six players. In Tales of Old (not yet listed on this site, but is available from VP). Victory Point has also created several single characters as promotional expansions. Each comes with all the cards needed to play the character. These smaller expansions used to be available through the BGG Geek Store, or directly from Victory Point; however, they no longer appear to be available anywhere. They can be fund, so good luck finding them! Darkest Night is a co-operative board game for one to four players. Designed by Jeremy Lennert, the game is from Victory Point Games. Choose your heroes. The base game ships with nine to select from. Each has power cards, giving you special traits and abilities. Each hero gets a turn indicator that allows players to change the order of player turns. This can aid in the turn order strategy your group leverages to take on the baddies. To start the round there are special character powers that can affect your hero at the start of their turn. If you have ventured out of the Monastery you draw an event card. Events include all sorts of bad things to fight or affect you or the game. There are plenty of actions for your hero to take. If you are hanging out in The Monastery, why not try your luck at praying by rolling two dice? You can attack a blight at your current location. Roll a die that is equal to or greater than their might and the combat was a success. If it wasn’t a success you suffer the failure consequences. You can also choose to allude if you are not as powerful as your opponent. Search a location by rolling two dice to see if you were successful in searching. If you rolled a number that is equal to or greater than the search difficulty number, you were successful. Select a Map card to see what you found. Have your hero retrieve a Holy Relic after collecting three keys. This will allow you to ultimately defeat the Necromancer. Near the end of your turn, you also have to defend any blights that are in your location. After all of the heroes have taken their turn, it’s time to find out where the Necromancer is going and what he is spreading. After his move is finished, the darkness tracker is advanced, which in turn gives him more power. Reset all the turn tokens and you are ready to go again. You win the game by either killing the Necromancer with a Holy Relic in tow, or by gathering three Holy Relics in the Monastery. The only way to loose is by having the Monastery become overrun with blights. The game strikes a nice balance between a lot of things going on – but not too much that you will become overwhelmed. 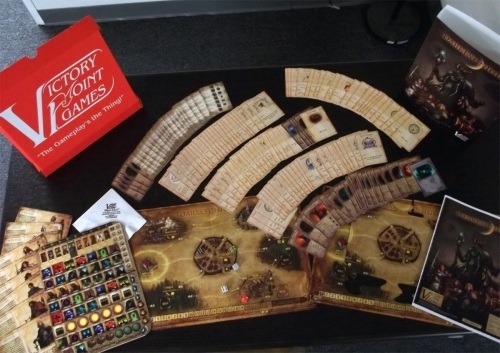 The boxed version comes with a thick laser cut game board and game pieces. The quality of the artwork is also impressive. Clark Miller and Daniel Taylor did a nice job of setting the mood. We were pleasantly surprised by this title. The game ships with a soot “Wipes-A-Lot” napkin. The laser cut wood pieces – which we love – leave a black laser dust that gets everywhere. It will take a couple of plays to get it off of all the game pieces. The box that the game comes in could end up getting damage. The slide over cover will get banged up or ripped. We plan on pulling this game out a lot and it’s bound to happen. Add a Review for "Darkest Night"